Rosy the Reviewer: Rosy's Test Kitchen #4: Cooking Successes and Cooking Conundrums - "Sweets!" Rosy's Test Kitchen #4: Cooking Successes and Cooking Conundrums - "Sweets!" OK, I admit it. I love sweets. You are not going to find me writing a post about giving up sugar any time soon, and that probably explains why I am not thinner, but as my mother used to say about things she deemed I couldn't help, "You come by it naturally." That's a Midwest expression for such things as being fat because being fat runs in your family or being a good singer because your Dad was a singer or being a gifted athlete because someone long, long ago in the family was a professional football player. I come by loving sweets naturally because both of my parents had sweet tooths (or is it sweet teeth? ), and there wasn't a week that would go by without a trip to Mill's Ice Cream for an ice cream cone or a taffy apple (that's what we called caramel apples) or my mother whipping up some fudge in the evening or her having a homemade coffee cake ready for Sunday morning before church. My Dad's hot fudge sundae recipe was amazing (Pet Milk was supposedly the key ingredient but the recipe has been lost to the ages), and no one has ever replicated the light golden crust sprinkled with sugar that graced my Mother's gorgeous and delicious homemade pies. My Grandmother had diabetes from a fairly young age and my Dad used to say it came from her and him going to the movies together several times a week and devouring whole bags of candy. I don't think you can get diabetes from that, but it's a good illustration of the power of sugar in my family. 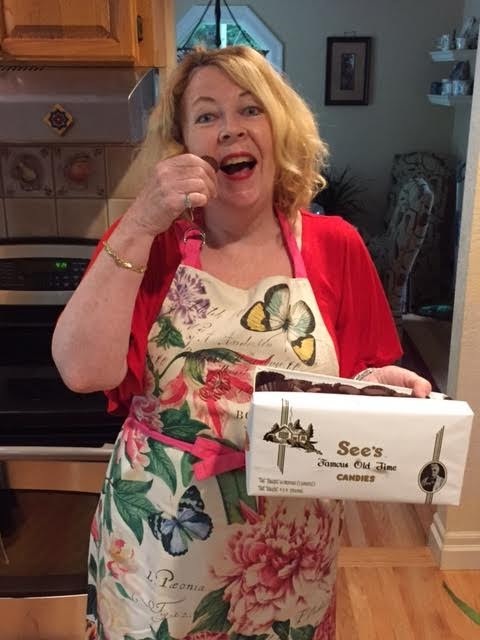 So, yes, I come by my love of sweets naturally because I come from a long line of sweets lovers. So I guess it's only natural that Rosy's Test Kitchen would take on some recipes for sweets. Here are some of my favorites with my usual successes and missteps so you can get some tips and learn from my mistakes. 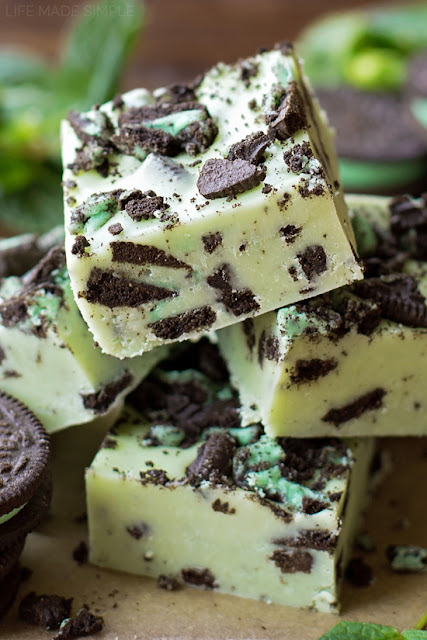 If you like mint-chocolate and Oreo cookies, this is the most delicious fudge you will ever eat and it's so easy, even I can't screw it up! Well, I kind of did the first time but came up with a solution that made these even more scrumptious! Melt the chocolate with the milk, butter, extract and salt your favorite way to do that, though the recipe says to set a bowl over a medium saucepan filled with 2 in. of simmering water over medium-low heat which should take about 8-10 minutes but I get you could melt all of that in the microwave too. Once melted, transfer the mixture to an 8 x 8 baking pan lined with parchment paper with a 2 inch overhang and coated with cooking spray. Top the mixture with the cookies pressing them into the fudge. Chill for at least 2 hours, then lift from the pan and cut into 24 squares or how ever many you want or just leave it a big hunk of fudge and break pieces off as you devour it. What I liked: Who doesn't like fudge? And it's super easy to make! What I didn't like: I didn't have any peppermint extract so I didn't use it. I mean who has peppermint extract lying around? What I learned: You do not have to use the peppermint extract. I didn't and the fudge was still delicious. BUT HERE IS THE MAIN THING I LEARNED: the first time I made this, no matter how long I chilled it, it was still kind of mushy (I probably screwed something up along the way). So in a bit of pique, I stuck the whole thing in the freezer and guess what? That just made the fudge even more delicious. It's almost like a frozen ice cream. You can keep the fudge in the freezer and just break off a hunk whenever you want something chocolatey, minty and delicious. VERDICT: My favorite fudge recipe! The combination of chocolate and cherries is one of my all-time favorites. That probably came from the fact that my Dad used to bring home a box of Brach's chocolate-covered cherries every so often. I know Brach's is not considered a high-end line of chocolate. I mean, you can buy them at the drug store, but back then, it was a delicacy, for my family anyway. This recipe fulfills my craving for chocolate-covered cherries without the calories. Crush the cornflakes in your fingers into a bowl and add the cherries tossing them all together. 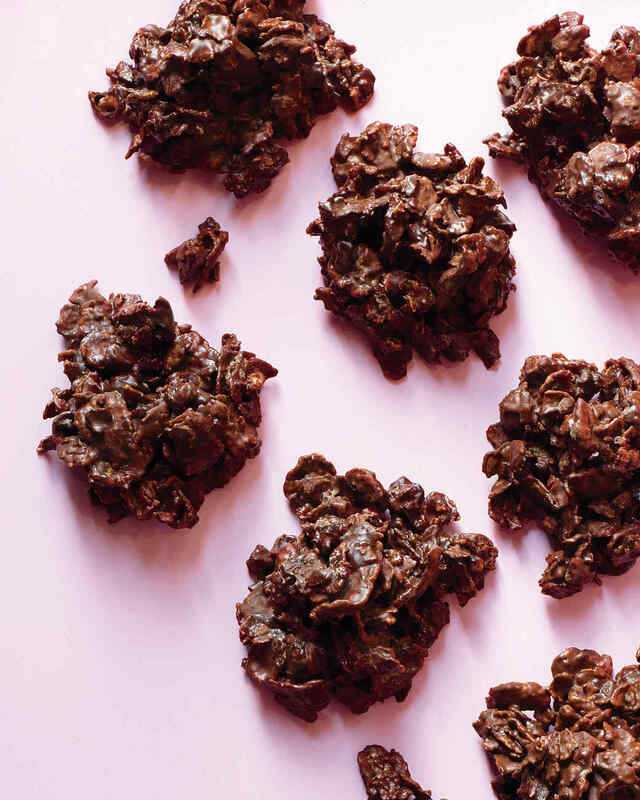 Pour the chocolate over the cornflake mixture and gently fold it all together until the cherries and cereal are completely coated with the chocolate. Drop by heaping tablespoons onto two parchment-lined baking sheets and leave to set in a cool dry place for an hour. Voila! What I liked: I adore cherries and chocolate together and this recipe is SO easy! What I didn't like: I hate melting chocolate and cleaning it up later is a pain. What I learned: If you melt chocolate in the microwave, do it in 30 second increments and watch it carefully because that method can lead to gummy chocolate before you know it. Verdict: Foolproof (except for the microwave part, if you are not careful). A virtuous version of eating chocolate - I mean, it's fruit! Toppings of your choice: chopped peanuts, flaked coconut, whatever. Go for it! Once again we are melting chocolate. Do you get the idea that I love chocolate? Cut each banana into six pieces, insert a toothpick and freeze. Meanwhile melt the chocolate and the shortening in the microwave and stir until smooth. 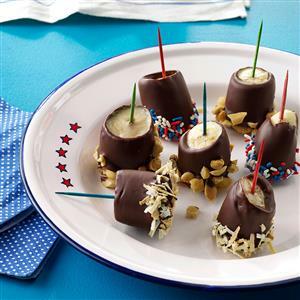 Dip the bananas in the chocolate, add your toppings and freeze at least 30 minutes. What I liked: This is about as low in calories as you are going to get for a chocolate treat! 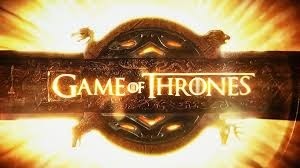 What I didn't like: The name is stupid. What I learned: You don't need to use the toothpicks. In fact, the toothpicks make this recipe harder. Verdict: Easy but why not just call these "Chocolate Covered Bananas?" I first discovered blondies when I used to go to a foreign film movie theatre in Santa Cruz, CA (I think it's still there). The ritual was to get a soda and one of their delicious blondies. I had always been a chocolate brownie girl until I ate one of those. 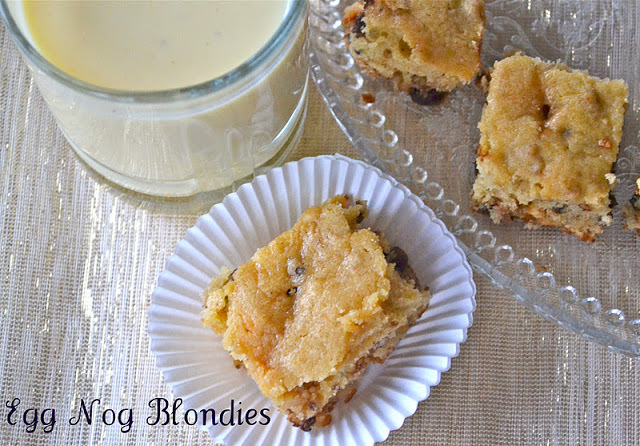 Now blondies are a favorite and this recipe puts an interesting twist on the classic. Whisk together the flour, baking soda, cinnamon, nutmeg and salt. In another bowl, using an electric mixer, beat the butter and sugar until fluffy, about 3 minutes. Then beat in the eggs one at a time, then the liquor and vanilla. Stir in the dry ingredients until just combined and then fold in the chocolate chips. Transfer the mixture to a greased 9 x 13 in. baking pan lined with parchment paper leaving a two in overhang on two sides. Bake at 350 degrees for 30 minutes. Cool for 20, then lift the brownies out by the overhang and let cook completely. Cut into however many pieces you want. What I liked: I adore blondies. What I didn't like: Waiting for them to cool! What I learned: There's no eggnog in eggnog blondies - it's whiskey! Verdict: Very good with a GLASS of whiskey! I shared my Aunt Laura's recipe for caramel ice cream in my blog post "A Baby Boomer's Food Memories - With Recipes From My Mother's Kitchen" back in 2013. 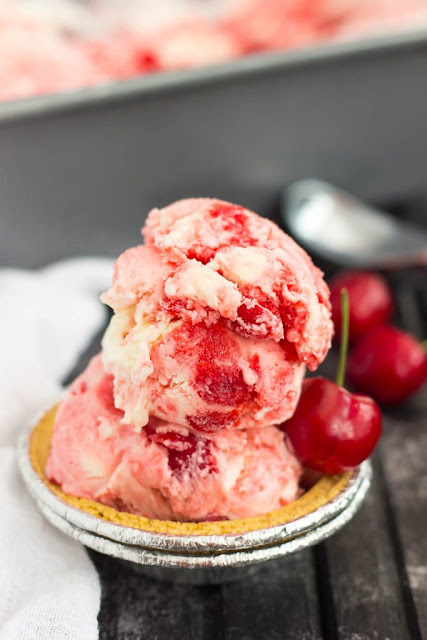 I have never tasted ice cream so delicious as that, and we didn't make it much because you had to get the salt and the ice and use the old crank ice cream maker. Just seems like such a pain these days. So if you are in a hurry, there are some good recipes out there where all you need to do is throw some ingredients together and freeze them. Yes, the texture is not as creamy, but it does satisfy that need for something sweet, icy and cold. Use an electric mixer to beat the cream in a large bowl on medium high speed until stiff peaks form about 2 to 3 minutes. Fold in the sweetened condensed milk and vanilla and then add the graham crackers. Transfer the mixture to a large 10 x 5 in loaf pan. Dollop 1/2 cup of the pie filling over the top, then swirl! Add the remaining cream mixture and pie filling and swirl! Freeze until firm, at least 8 hours, lightly covering with plastic wrap for the last four hours. Serve with additional graham crackers if desired. What I liked: I didn't have to buy an ice cream maker. What I didn't like: Two to three minutes to form those stiff peaks? More like a half hour! And I hate using an electric mixer! What I learned: If, when beating heavy cream, you want it to form stiff peaks in a reasonable amount of time, make sure that not only the cream is VERY cold but the bowl and the mixing blades are as well. I also learned just how many calories there are in sweetened condensed milk (save yourself the scream that I let out and just don't look). Verdict: It's yummy but I suspiciously get gas after eating this! Must be a reminder of all of those calories in the sweetened condensed milk! This is one of those recipes that appears from time to time on Facebook, so I thought I would give it a try. 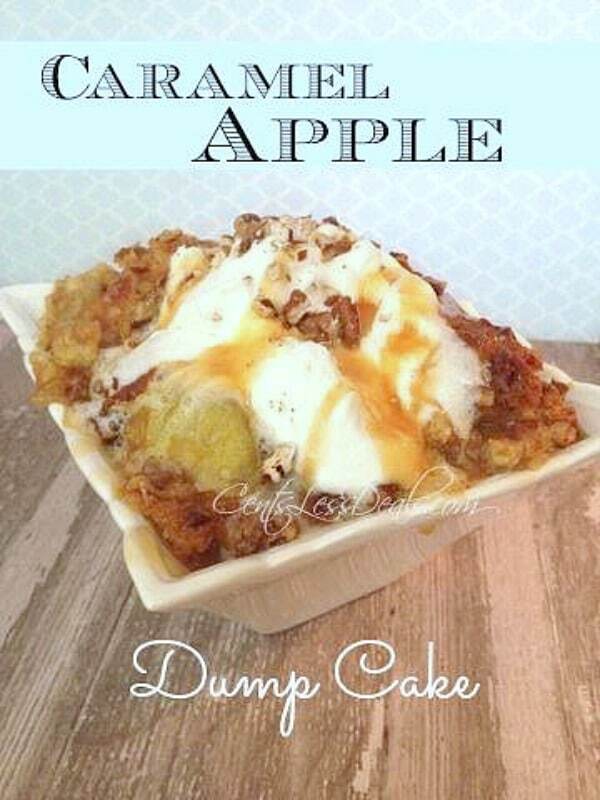 It's called a Dump Cake because you basically dump everything together. Stir the pie filling and the caramel sauce together and place in a greased 9 x 13 pan. Pour the cake mix over that and spread evenly. Top with the melted butter. Bake for 45-50 minutes at 350 degrees. What I liked: It's a little hard to wreck a recipe where you just dump everything into a pan and bake it, right? What I didn't like: I did wreck it! It wasn't done after the 50 minutes so I decided it needed to spend more time in the oven and then my short-term memory loss kicked in and I forgot about it! What I learned: I have short-term memory loss. Verdict: All in all, this didn't work very well for me. It is a very sweet dessert, and despite the cake mix, the consistency turned out more like a topping so beware of those FB dump cake recipes. But maybe that's how it turned out because I forgot about it and baked it too long! Let me know if you have a better result! Well, that's it for Rosy's Test Kitchen for this month. See you soon! I think I will tackle eggs and breakfast recipes next! I just got a diagnosis of being pre-diabetic, so I read this post with a tear in my eye. If I could have but one taste of every one of these I would be so happy. The mint-cookies-and-cream fudge is the stuff of dreams! Sorry about your diagnosis. That is shocking to me since you are so thin but I guess we don't really know how that stuff works. Diabetes runs in my family but so far so good.